So, I'm a complete arduino newbie. I left a live wire close to my arduino and part of it burnt (underneath the USB output). The LED that indicates power still turns on when I plug it into my computer, and a simple LED circuit on my breadboard, when hooked up to the arduino, still works. The only thing that's wrong is that my computer doesn't recognize the Arduino serial port any more, so I can't upload any code onto it. I also own a bluetooth HC-05 module. Is there any way I could upload code onto my Arduino wirelessly, using that? Or am I better off just buying a new one? If the main MCU is still functioning fine then yes, sure you can. The only caveat is that you may have to manually reset the Arduino at the right moment in order to enter the bootloader for programming. Configure the bluetooth module to work at the bootloader baud rate (115200 baud) - you may need to wire it to your PC to manage this part. Connect a virtual COM port to it and program through that. Press RESET just as it's about to run AVRDUDE in the IDE. You did not say which Arduino you are using. 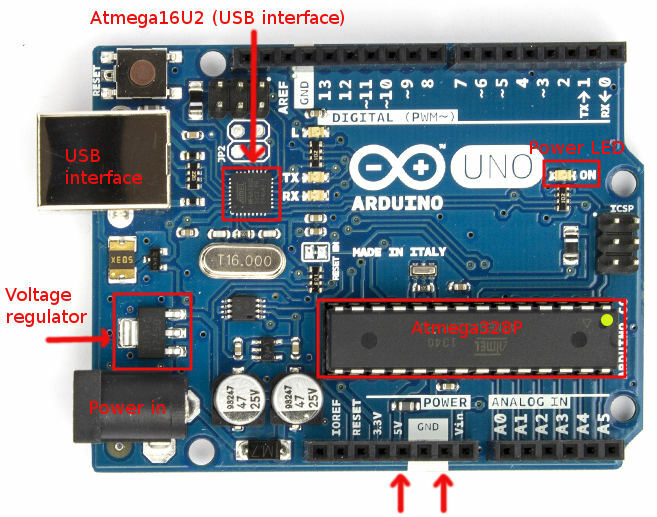 Most Arduinos abstract the complexities of the USB interface, format and protocol by using a 2nd processor on the Arduino board. If damaged, you will essentially have to replace this function. It is unlikely that a Bluetooth radio will act similar enough to do this. If the main processor and supporting circuitry is not damaged, it would be easier to program the Arduino from another Arduino such as described here. It sounds like you have fried the Atmega16U2 which is programmed as a USB-to-serial converter, as seen in the picture below. You can still program the Atmega328P microcontroller using the ICSP and an appropriate Atmel programmer such as the Atmel Ice or the AVRISPmkII. Alternatively you can use another Arduino Uno as a In-System Programmer. I cannot say about using a bluetooth HC-05 module,however I imagine it would be a fair bit of effort and hence would be easier to buy a new one. Keep the current one though because you can use the new one as an in-system programmer as per the link above. Not the answer you're looking for? Browse other questions tagged wireless upload or ask your own question.